– Minimum CPU required is 1 GHz, but that’s the absolute minimum. It is better to start from 2.5 GHz, with dual- or quad-core architecture. Intel and non-Intel processors are both supported. – It depends on what you will run on top of your WebLogic, but a good start is 3GB, considering the number of simultaneous users, sessions, and in-memory programs. – Storage refers to local hard disk or external storage. For just a WebLogic Server, installing 3 GB is enough, but be aware that normally you have to install additional software afterwards and configure your WebLogic domain. Consider around 7 to 11 GB, and then you’re on the safer side. – Hardware or virtualized? Nowadays most companies use virtualization of hardware to reduce costs. Virtualization can be done on AIX (LPAR), Sun (LDOM), or VMware. For a long time, Oracle did not support virtualization, but now Oracle offers its own virtualization solutions, such as Oracle VM and Virtual Box. Highly scalable and sustainable, we had one machine running very fine for over 2yrs without any restarts. file descriptor limits can be checked by “ulimit -aH” command. but this will set only for that session, so its suggested to put the command in the script which starts the JVM. Here, tmpdirpath is the full path of the directory that you want to designate as a temporary storage area for the installation program. Depending on your platform, you will have to choose the OS-specific package installer (.bin or .exe file) or a generic package installer (.jar file). For all 64-bit operating system versions, only a generic installer is available. If asked which one to choose i would go for generic jar(Ex:wls1033_generic.jar) file installer as it fits to all OS where system specific JDk is installed. I usually prefer to use Sun JDk as all my applications are tested on Sun JDK but you can also run it on IBM JDk and Jrockit(preferred by Oracle in Production modes) if required. Download binary file from Sun/Oracle download and install into a folder, jdk*.bin extracts to a folder name with the version of JDk. To set the Java environment login as the weblogic admin user which will be used to install weblogic app. server and do the following. For large processes using bigger stack size is good and it can be set by using ulimit -s number as given above. STACK SIZE – Limits the amount of memory a process can allocate on the stack, as in the case of local variables in C, C++ and many other languages. Limiting the stack size stops runaway recursive function calls; however, it is possible to legitimately allocate large arrays of data on the stack without unreasonable recursion. Specified in kilobytes, in the bash shell, as found in Linux and many other systems. 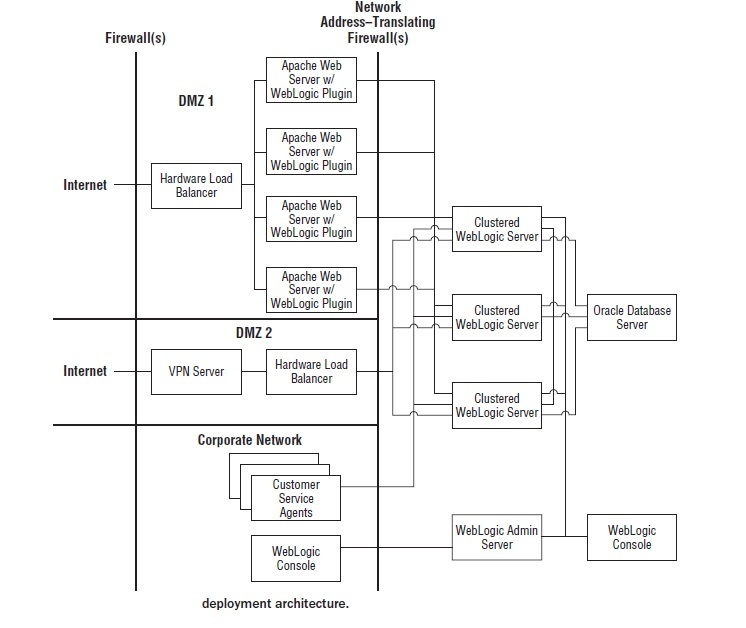 Below is a sample architecture for weblogic environment which is production ready and secured. Now you are ready for Oracle Weblogic Installation. Please go to this link for Weblogic Installation steps.